After great anticipation we are happy to announce that Vignette Issue 11 from Leanne's House is being shipped from Australia! If you have not been bitten by the Vignette bug please visit our website to view the first 10 issues. If you are on our auto-ship list for Vignette 11, please make sure you have updated your billing information. This month Carolyn will be discussing Civil War era reproduction quilts. Due to the overwhelming response to Carolyn's discussion, a second session on Friday, March 21, 1-3, has been opened. Don't miss this fun, informative lecture. Enroll Here! Cindy Sharp, Moda Bakeshop Chef, will be demonstrating precision piecing techniques from her online Block of the Month, S'More Rows. Join Cindy, Saturday, March 15 at 11am, to see her free demonstrations. 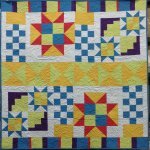 Many of the techniques she will show you can be applied to other quilt projects. M.J. has 50 years of quilting experience and is a master quilter. 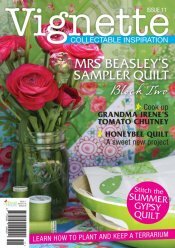 She will teach you how to make a quilt you will be proud to show off. You'll have fun and learn great skills with Janet! 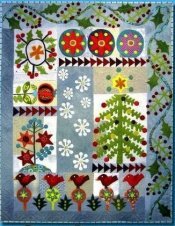 She will teach you the basics of hand embroidery from transfering your design to fabric and several timeless stitches you'll use over and over.